After what seems to be a blip in time, but really almost 5 years, and over 1200 posts on strategyaudit.wordpress.com. I finally got around to taking my own advice, and moving onto my own hosting using my domain. 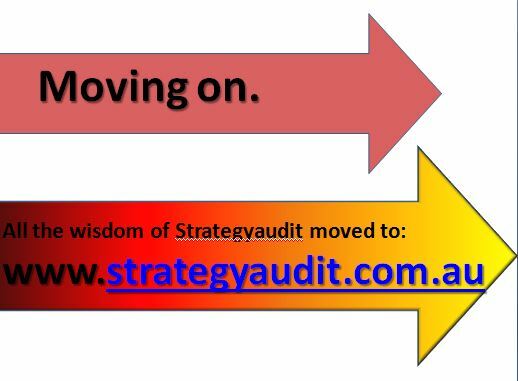 From now on, late October 2014, my musings will be on www.strategyaudit.com.au. The same passion to assist small businesses compete effectively and sustainably, same set of hobby-horses that from time to time get a run, and the same irreverent and hopefully fresh take on the self-interest, hubris, inconsistency and sometimes laughable decisions those so called leaders we are saddled with take, mixed in with the serious comment. Thanks for the last 5 years, and I look forward to the next 5, after which I might just find a palm tree on a tropical beach, and really get serious.